May 2014 Fleet Review – HubNut – celebrating the average! I’ve had a quiet couple of days on the car front. Frankly, it’s hard to know where to go next after the delights of a Kia Pride. Sadly, it seems that my thinking has focussed on saying goodbye to the BX. I really like the concept of the BX. It offers a wonderful mix of super-comfort, super-practicality and ridiculous economy. But I’m finding that the same niggles are frustrating me, and reminding me why I quit BXs last year. The single windscreen wiper annoys me, as does the lack of a ‘flick’ wipe – an essential feature when you live in Wales, where there are at least one hundred and eleventy different grades of rain. The crap interior quality is a source of annoyance too. I’ve utterly failed to track down some of the trim rattles and every BX seems to have rattles in different places. That’s a poor list of excuses really though isn’t it? It seems more the case that I’m just bored, having owned many BXs between 1999 and now. In truth, financial matters are forcing my hand somewhat too. Our low-income, hippy lifestyle doesn’t really allow for huge expenditure on cars. I’m trying to run three of the things on a shoestring budget. All of the cars have their faults, and I can’t afford to sort any of them out at the moment. What can’t be avoided is road tax though, and as I’m still punished for enjoying middle-age tin, there’s no way of escaping it. The Sirion’s tax is up for renewal and sadly direct debit is not yet an option. It’ll be interesting to see how that works when it comes in later this year. I shouldn’t complain. The Sirion has proved an excellent choice of machine. It has cost very little since I bought it for £370 last October. I’ve changed the engine oil twice and the front caliper sliders once. There will be bodywork to attend to before the MOT expires in July though – the sills don’t really seem to be there. And here’s a strange observation. I love a comfortable ride. It’s why I own Citroens. The Sirion is pretty dreadful. Yet I’m finding that given a choice, I’ll choose the Sirion over the BX. That’s not a good sign. So, a fleet adjustment is in order and the BX is the one for the chop. Yes, it’s the most practical vehicle I own, but it also has by far the least engaging engine. 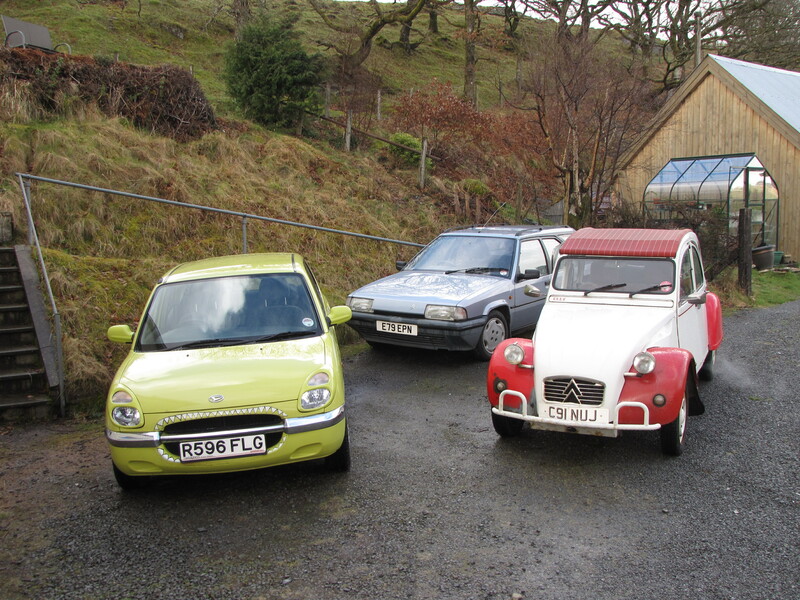 The Sirion and 2CV prove that economy can still be fun and while the BX still has marvellous handling, it always feels a bit of a plodder – lacking the fizz of the Sirion’s screaming triple, or the 2CV’s vocal flat twin. Naturally, I’m already contemplating what comes next, though this is somewhat at odds with my desire to keep the Sirion on the road and the need to pay a looming tax bill in July. I fear I may have to go down the road of owning only two vehicles for a while, which is somewhat at odds with my desire to stop the 2CV rusting away. She’s been spending a lot more time hiding in the garage of late, only coming out when the weather is fine. I must admit, 2CVing feels more fun when water isn’t dribbing down the dashboard and into your shoes. I’m also hoping that it’ll slow the body rot somewhat. For now though, I shall attempt to move the BX on to a new owner and will do some window shopping as I try to decide what, when I can afford it, will be the best BX replacement. A warbling, five-pot Volvo 850 turbo diesel is appealing.